Kentucky and Indiana just cut the ribbon on the new $1.3 billion “Downtown Crossing” bridge, part of the even bigger $2.6 billion “Ohio River Bridges” project, which encompasses two new bridges over the Ohio River and one enormous tangle of an interchange. The project was widely ridiculed for its outrageous expense and for degrading the connection between downtown Louisville and the riverfront. To top it all off, the drivers the downtown bridge was built for — suburban commuters whose travel time was deemed to be so important — don’t seem to appreciate it that much. Joe Cortright at City Observatory has been using live traffic cameras maintained by the Kentucky Transportation Cabinet to investigate traffic conditions on the brand new bridge. What he found on Tuesday at 5 p.m., which should be the height of rush hour, was an empty highway, shown above. This very anecdotal, if visual, information suggests a couple of hypotheses. First, it does appear that a fairly large segment of traffic crossing the Ohio River in Louisville on this particular afternoon chose the older, slower and non-tolled route over the newer, faster and more expensive tolled freeway bridges. Second, it seems like there is plenty of capacity crossing the Ohio River at this particular point to accommodate all these vehicles. Not only is the freeway nearly deserted, but traffic appears to be well below capacity on the Second Street Bridge as well. Of course, this is a small sample and a highly unscientific set of observations. But taken at face value, these pictures call into question the decision to spend several billion dollars to increase highway capacity over the Ohio River. If so few cars are actually crossing the river at peak hour on a typical business day, and if such a relatively large proportion of them apparently prefer to use the older, slower route rather than pay to use the fancy new crossing, did the states of Kentucky and Indiana have any reason to spend so much to build a giant new bridge? And will the two states, who are counting on toll revenues to pay back a major share of the cost of the project, be able to cover their debts? As Cortright says, it’s too early to reach conclusions. But this project will be an interesting one to watch. Kentucky, especially, borrowed enormous sums to build these highway bridges, based on projected revenue from tolls. If the state’s projections were off the mark, it could cost the public dearly. There are plenty of examples of new toll roads failing to make ends meet. In this case, residents of Kentucky and Indiana would be on the hook, as would people all over the country, since the feds helped guarantee the loans. More recommended reading today: BikeWalkLee carries a column explaining why Fort Myers, Florida, topped Smart Growth America’s recent list of most dangerous cities for walking: It’s a design failure. And the Political Environment wonders why no one in Wisconsin is mentioning higher speed limits as a factor in the rise in traffic deaths. Luckily, I have no need to go to Lville, so extortion won’t work on me. And it’s not “a couple of bucks.” It’s $4 each way, they’re raising the rates next year, and there’s already taxes I’m paying for it. Small niggle. “Tolled freeway” is an oxymoron. “Tolled expressway” would be more correct. I am from Tennessee and just received my Riverlink bill. At the price being charged, you’re bridge should be paid for in a year. I always have the option of driving through Illinois to get to Chicago which is what I will do in the future, so your outlet malls and gas stations will no longer receive my money. How much money did your politicians receive from the companies involved to pull this off? It should be illegal for a state to charge a toll on an interstate highway receiving federal funds. I don’t agree the East End Bridge is superflous. I now have my sanity back thanks to the east end bridge. An AVERAGE 45 minute commute to Indiana via 64w was what I faced for thirteen years. I now have, at max, a predictable 25 minute commute. I don’t mind paying for the convenience of having more time, less gas use, less wear and tear on my car now. Those who are saying it isn’t worth it should also consider these factors in conjunction to saving time. Plus, as the city continues to grow, urban sprawl, these bridges will get used more and people will eventually “grow brains” and realize the benefits. Besides, if the Sherman Minton is as “bad” as officials say it is then how do we know they won’t close that bridge again for more repairs? I also believe if they don’t meet their revenues they will toll the Sherman Minton too. I do agree this article is a “knee jerk” and unscientific analysis meant to stir up controversy. Not news. I see many commenting on the price and yes, it is expensive if you don’t have a transponder but with a transponder, a single crossing is only $2. Very large trucks and semis will pay more. And no, there’s not alot of traffic on the bridges most of the time but you must take into account that they completed 2 brand new bridges (One to downtown and another HUGE bridge to the east end of Louisville). Before the bridges were finished, it was bumper to bumper traffic every day and one accident could cause you HOURS in delays. Opening these new bridges allows traffic to flow freely and with enough space that drivers don’t really need to be concerned with any construction, traffic delays or accidents. It’s now 8 lanes wide in each direction at the downtown bridge. 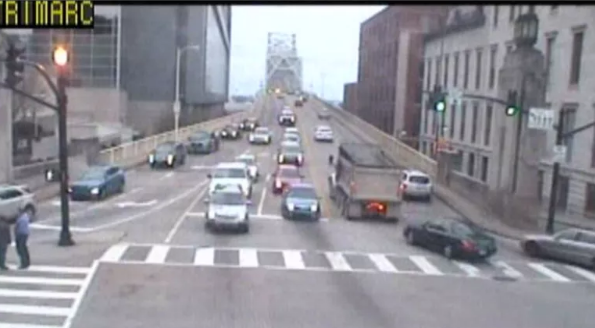 I also see the picture with this story shows the 2nd Street bridge with very little traffic however, traffic does get backed up on this bridge due to it constantly being down to only one lane due to construction and repairs. One fender bender or stranded vehicle can virtually shut this bridge down for hours at a time. If you don’t want to pay the $2 then all is welcome to travel to the I-64 Sherman-Minton Bridge and cross into Louisville there. Traffic has increased on that bridge due to the $2 tolls on the others and unless you’re heading in that direction, you’ll likely spend that $2 anyway in extras gas going out of your way. – Hoosier Bud ?!! It is a known fact , not sure whose “fact” you are referencing. you CLEARLY have never driven downtown at rush our or any where near the junction. After this was put in traffic is sooo much better. The east end bridge is a nice to have, but will be really nice as things continue to grow. Yeah the whole article is BS, clearly not researched and clearly meant to get a rise, out of gullible people. Small minded people, are always entertaining to read. There are A LOT of things incorrect with this article… but closed minds. LOL now that’s funny. You know they said the same thing about the Gene Snyder I-265, now look at it. People of such small minds and narrow thinking. you got your name right for a stupid comment like that. Wow. Did you notice that many months ago, 1/2 the lanes on the second street bridge closed to repaint. Those lane closures will be happening for another year. At night, there’s a flagman, and only one lane to wait to cross the bridge on. Sometimes the entire bridge is closed. The only other choice is the toll bridges, unless a person wants to drive 30 or 40 miles out of their way and cross the Sherman Minton Bridge. So, in effect, the only failed comment here is yours!